The Page 99 Test: Gerald Early's "A Level Playing Field"
Gerald Early is Professor of English, African and African American Studies, and American Cultural Studies at Washington University in St. Louis. Page 99 of A Level Playing Field lands the reader a bit more than two-thirds through the second essay of the volume: “Curt Flood, Gratitude, and the Image of Baseball.” On this particular page, I am in the midst of an account of how the black press reacted to St. Louis Cardinal outfielder Curt Flood’s legal challenge to major league baseball’s reserve clause, which restricts a player from being able to offer his services to any team even if he has achieved a certain level of seniority. In effect, Flood was suing for free agency, something, of course, which baseball adopted in a modified form in the 1970s, a few years after Flood’s suit but not because of his suit, which was denied by the Supreme Court. The black press was largely supportive of Flood, although Flood’s claim of being “a slave” puzzled many whites (and some blacks, although blacks were less disturbed by the metaphor). He was making $90,000 a year at the time he was traded to Philadelphia in October 1969 (the act that triggered his lawsuit), a considerable sum at the time. But the idea among some blacks—including New York Times sportswriter William Rhoden even today—that playing high-level sports somehow degrades blacks is one of the main themes I explore in my book. This means that any sort of protest by a black athlete against the system, the bureaucracy, the institutional power of high level sports (run by whites and largely supported by white fans) is: 1) highly politicized in a form of entertainment that frequently gets politicized despite the fact that sport acts as an escape, and 2) a symbolic assertion of dignity and freedom for an oppressed group even if the athlete is making millions. I find this belief fascinating. Page 99 does not sum up the book. (No writer would admit to his or her book being reducible to one page, even if it were true.) But it comes close, in a highly truncated way. 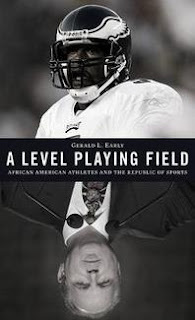 Learn more about A Level Playing Field at the Harvard University Press website.